If you thought the experience of the late Mulrunji Doomadgee was a one-off, watch this video about some police in Queensland. In all this talk about Liberal staffers writing chapters for Liberal MP’s who plagiarise from Kiwi businessmen, let’s not forget the poor folk at Melbourne University Press. 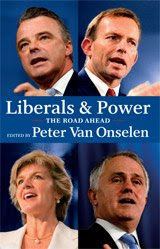 If the MUP website is any indicator, the publisher must be wishing a certain book about the Liberal Party’s future would just disappear deeper into the catalogue. As of 4:45pm yesterday, the new book is absent from the MUP homepage, including from the news feed on the right hand side and the "November Highlights From MUP". The page dealing with "News and Forthcoming Titles" does mention the book under its "November 2008" section, though it appears below forthcoming titles on Graham Kennedy, Gough Whitlam and cricket. The "Events Calendar" page doesn’t mention the book’s launch, preferring launches of the books about Gough Whitlam, Graham Kennedy and feminism. Compare this to the huge billing for Peter Costello’s memoirs continue to receive in the homepage’s news feed as well as in the Photo Gallery, as well as the huge success of Wayne Errington and Peter Van Onselen’s excellent biography of former Prime Minister John Winston Howard. If a professional outfit like MUP can't market a book about the future of the Liberal Party, who czan? Indeed, if the MUP’s website is any indication, the future of the Liberal Party seems rather uncertain. An edited version of this piece was first published in the Crikey daily alert for 30 October 2008.